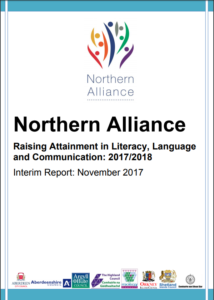 Today we are pleased to share the progress of the Northern Alliance Rasising Attainment in Literacy, Language and Communication workstream. 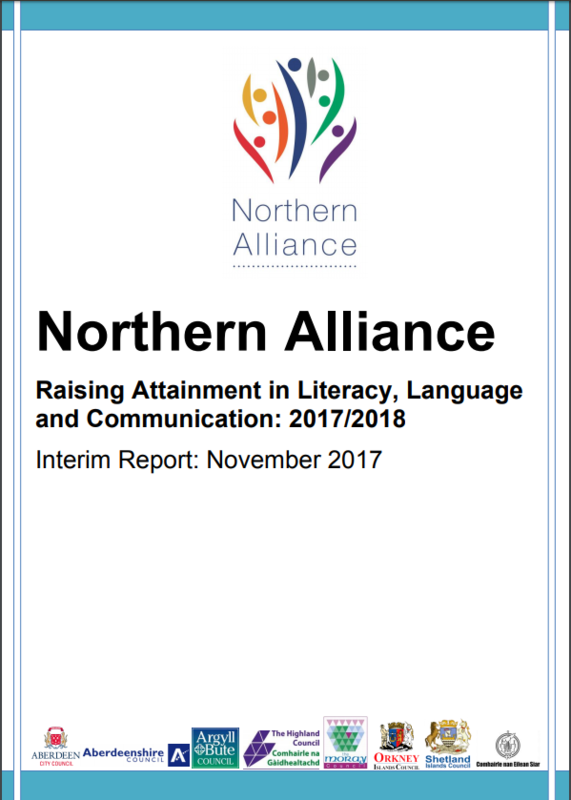 The interim report (November 2017) summarises the progress made in the Northern Alliance Raising Attainment in Literacy, Language and Communication workstream as of November 2017. The Raising Attainment in Literacy, Language and Communication workstream is providing direct support to practitioners in 47% of primary schools across the Northern Alliance during its second year (2017/2018). On Primary 1 entry developmental gaps in foundational reading and writing skills are to be expected. These individual differences arise from natural variation in development as well as from environmental factors. 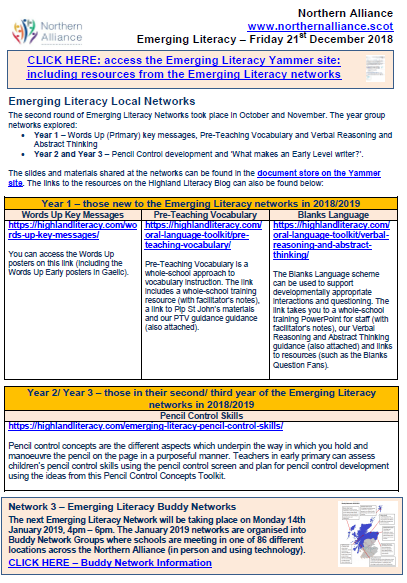 The purpose of the emerging literacy approach is to enable teachers easily to adapt teaching and learning to the expected developmental variations. On Primary 1 entry the particular pattern of gaps is different for each individual child. At a whole class level, each class will have different patterns, and there will be year-on-year differences in the same school. There are, however, areas of foundational reading and writing skills in which gaps are more and less prominent. It would not be developmentally expected for all children to enter Primary 1 with secure foundational reading and writing skills. Taking a developmental approach to Emerging Literacy therefore supports practitioners to identify said strengths and gaps to match teaching and learning to the needs of each and every child. On Primary 1 entry less than one in ten (7%) of Primary 1 children had fully secure phoneme discrimination, phoneme segmentation and phoneme blending skills, the phonemic awareness skills which underpin reading and spelling words using phonics. On Primary 1 entry less than four in five Primary 1 children (79%) had secure pencil control skills which underpin the writing of letters. On Primary 1 entry there is evidence of developmental gaps linked to deprivation. On Primary 1 entry there was a gap of 1.1 in the average scores (out of a possible 12) for Phonological Awareness between Primary 1 children living in the most deprived areas (SIMD 1-3) [N=4.3] compared with those living in the least deprived areas (SIMD 8-10) [N=5.4]. On Primary 1 entry there was a 10% difference in the percentage of Primary 1 children, linked to deprivation, who had a secure tripod grasp, a skill foundational to the manipulation of writing implements. Of the P1 children assessed 78% of those children living in the most deprived (SIMD 1-3) areas and 88% of children living in the least deprived (SIMD 8-10) areas had a secure tripod grasp. As part of the national arrangements for regional collaboration the Northern Alliance Raising Attainment in Literacy, Language and Communication workstream should detail the action plan moving forward within the Northern Alliance Improvement Plan (due to be published in early 2018). The successful model of collaboration developed within the Northern Alliance Raising Attainment in Literacy, Language and Communication workstream, and detailed within this report, should be shared with the Lead Officers of the Northern Alliance workstreams. The data published within this report should be used as a basis to monitor ongoing progress and performance across the Northern Alliance. At school level practitioners should continue to use the data to inform learning, teaching and assessment to raise attainment and close the poverty related gap. 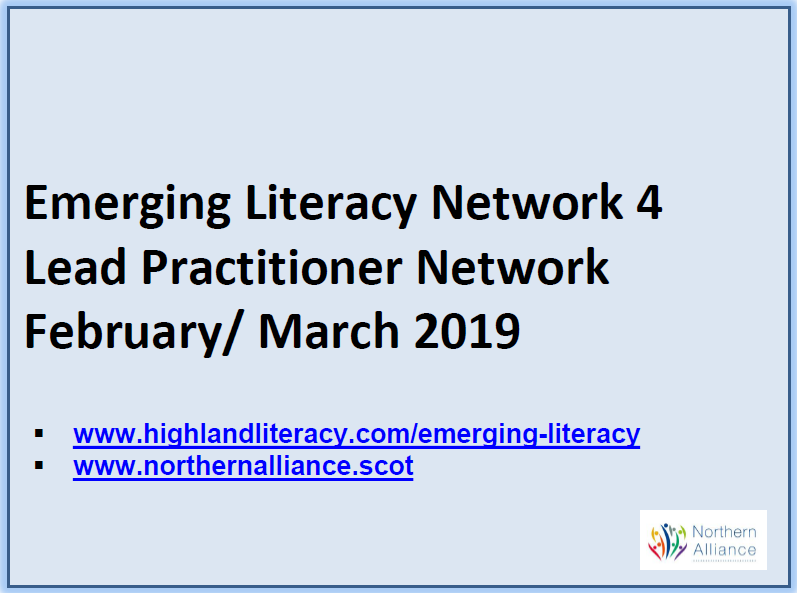 The Northern Alliance Raising Attainment in Literacy, Language and Communication workstream has been designed by practitioners for practitioners, with support from a wide range of Allied Health Professionals (AHPs) and other specialists. The collaboration within and between local authorities and health boards should continue to be developed to enable self-evaluation at practitioner level to inform the core support at regional level. AHP services may find it helpful to monitor the impact of participating in the workstream on service delivery against the Ready to Act. The learning from the Northern Alliance Raising Attainment in Literacy, Language and Communication workstream should continue to be shared at national level to support ongoing improvement for Scotland’s children and young people.